The United Nations Children Fund (UNICEF) has disclosed that Nigeria has the largest number of girls not in school and has launched an initiative tagged “Girls for Girls” (G4G) to facilitate education of girls as well as empower them with information and knowledge. The UNICEF Representative in Nigeria, Mr. Mohamed Fall, who announced this said the UN agency plans to facilitate the education of one million girls in Bauchi, Niger, Katsina, Sokoto and Zamfara states. 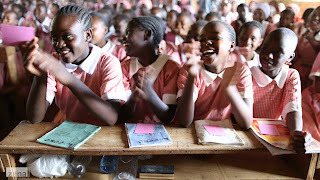 Fall disclosed this via a press statement signed by its spokesman, Mr. Geoffrey Njoku, lamenting that Nigeria has the largest number of girls not in school. He explained that the initiative would help the girls build their capacity and create access to education so as to enable them to stand up for themselves. “The G4G initiative is a component of the Girls’ Education Project Phase 3 being implemented in northern Nigeria through collaboration between UNICEF Nigeria and the Federal Government of Nigeria with funding from the United Kingdom (UK) Department for International Development (DFID). “This phase of the Girls Education Project seeks to help put 1 million girls in school, support them to remain in school and improve their learning achievement. The focus states have the highest number of girls who do not attend school in Nigeria. G4G groups will be established in more than 8,000 Primary and Qur’anic schools by 2019,” it stated. Fall also noted that with the commemoration of the Day of the African Child focusing on empowerment and equal opportunity for the African child, the initiative is timely especially for the girl-child. He explained that the primary goal of the initiative is to empower girls with knowledge, skills and confidence needed to enrol and remain in school and complete their education so that they could become role models to other girls in their communities. According to him, “the G4G initiative is a commitment to improve the quality of girls’ and ultimately women’s lives by empowering girls through education. By educating girls, practices such as early marriage will be uprooted and girls will be empowered to contribute to the development of their communities, states and Nigeria’’.